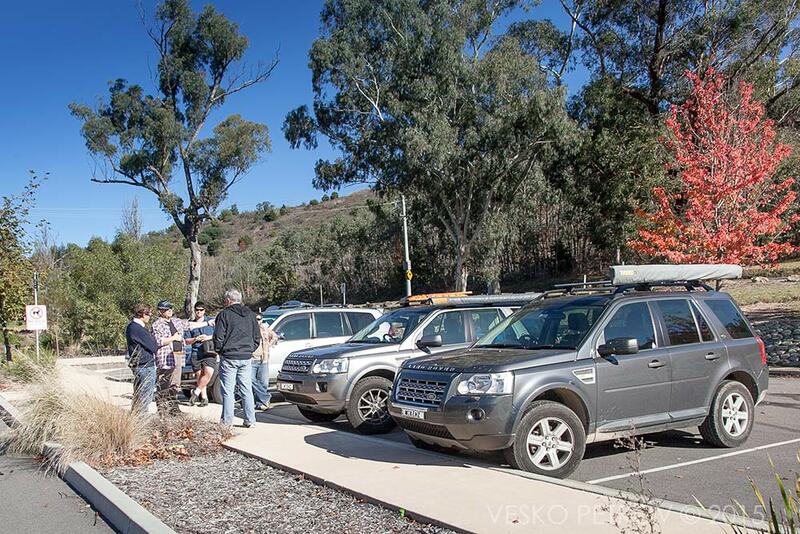 When Mike suggested we drive out of Canberra into the bush to climb some pick, cross some rivers, and camp for the night I was excited with the opportunity to meet this great guy again and to learn some more about four-wheel driving. I didn’t expect that our driving party would grow to more than two. You see – when I’m driving alone with myself, there are already too many people in the car, I’m not a very nice person to be with. Solo travel brings the best in me and that’s how it is. 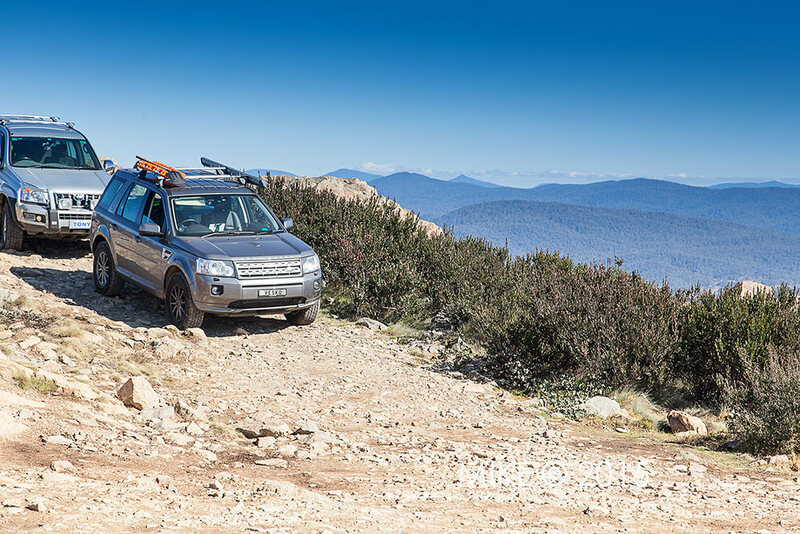 To you this might sound strange, but Mike understands it – the reason we clicked well in our previous trip over High Country Victoria. 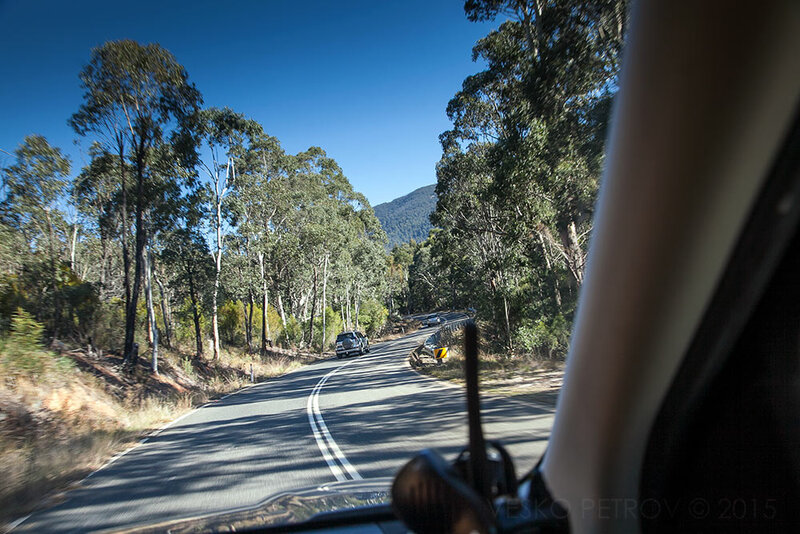 So when I learned that on the Brindabella trip we will be in the company of two, and possibly three more cars, I was apprehensive to the point of giving it up, but such chances don’t come around very often and I decided to go, thinking that I will survive 24 hours of imposing my presence to a few other people. 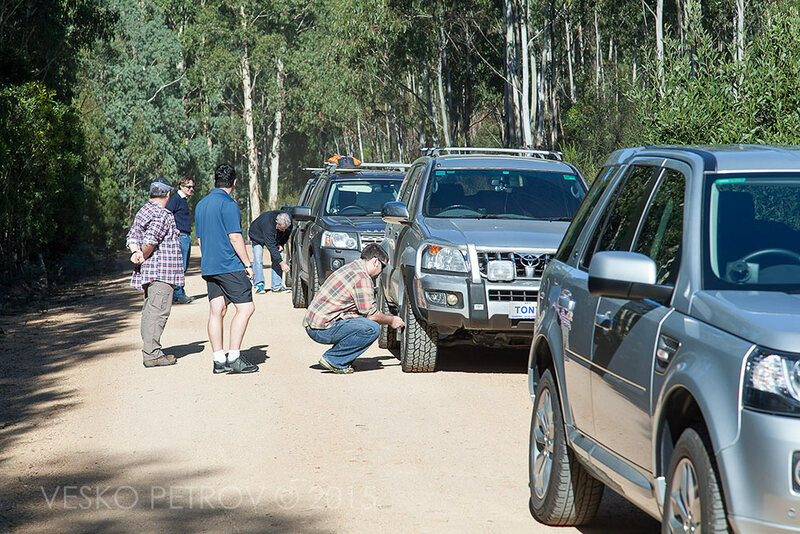 At the end I learned that I couldn’t be more wrong – driving the Brindabella Adventure with these great guys was simply amazing! As usual my Friday is super busy. After a twelve hours working day I am so tired, packing up for the trip takes until 1 am. 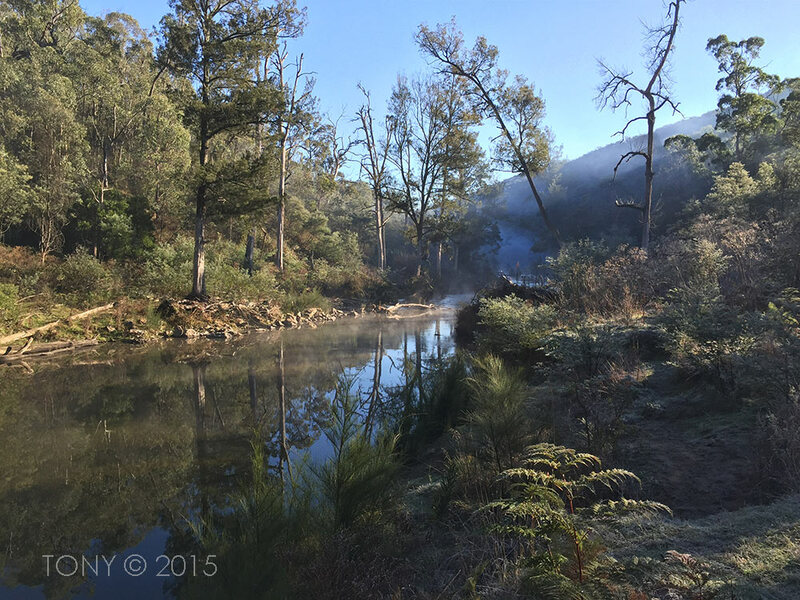 Four hours later my smartphone alarm kicks me out of bed for a dull drive out of Sydney. I’m grumpy at the petrol station where a bag of fire wood costs me $18.50 and the dark clouds in the sky don’t help my moods. Then it starts to drizzle and I wander if the trip is not already cancelled, but nevertheless I drive the M7 determined to be on time for the 9.30 am meeting at the Visitors Centre. Then just like that the darkness in my heart disappears – not even fifty km out of the city the sun smiles on me, the road becomes inviting and with a few sips of the strong coffee in my flasks the good spirits are restored. Later the phone rings with Mike confirming that the trip is still on, but with a different meeting place. Well, I don’t know Canberra that well and have no idea what place is he talking about. Generous as ever Mike say not to worry, he’ll pick me up at the Visitors Centre and will take me to that new meeting place. I am amazed that Mike remembers my real name, which to an English speaking person would sound pretty much the same as my blog name Vesko and as easily forgotten. 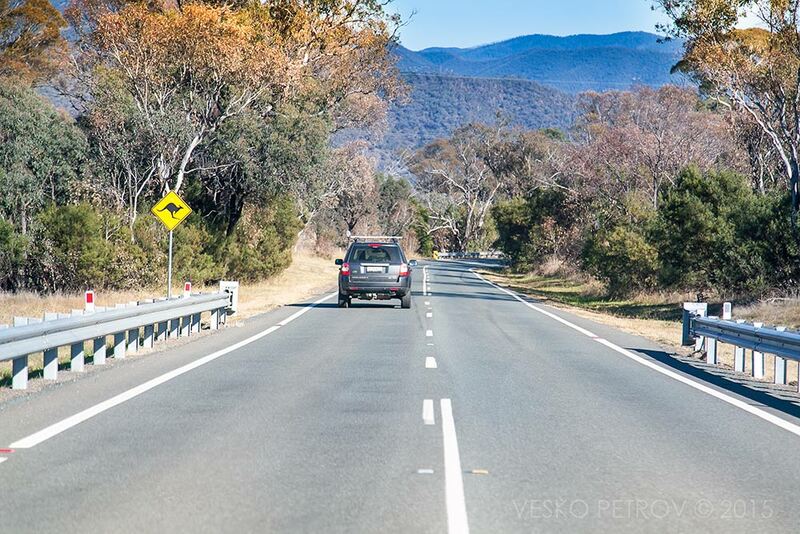 Somehow this makes me feel good and the 300 km to Canberra fly away like a song. The highway cops looking for my speed are napping in their cars at the comfortable turns on the highway, as I cruise along with 112 km on the cruise control. Despite this self-imposed legal speed restriction, at 9.30 am sharp I drive into the Information Centre’s car park (later Mike would say: I think you were late, but that’s typical of Mike’s sense of humour). Out of Sydney the sun is just breaking the clouds. 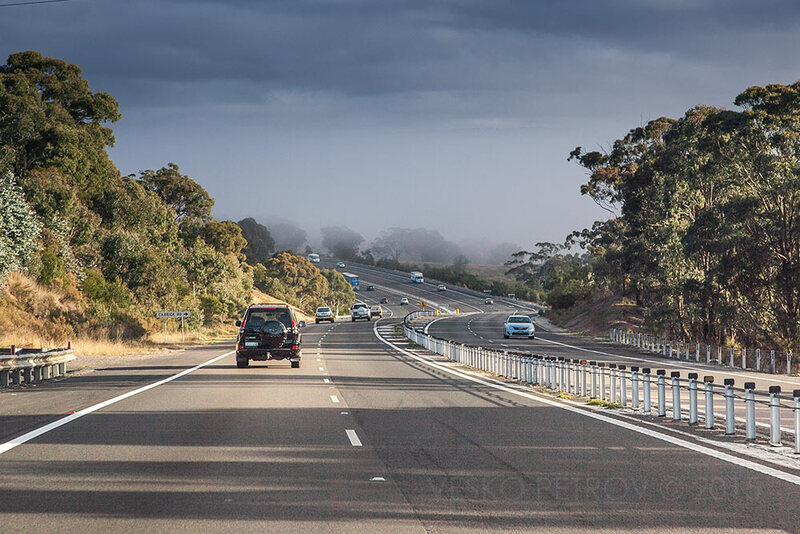 I love this stretch of the road to Canberra around Lake George. I don’t remember seeing water in this lake. 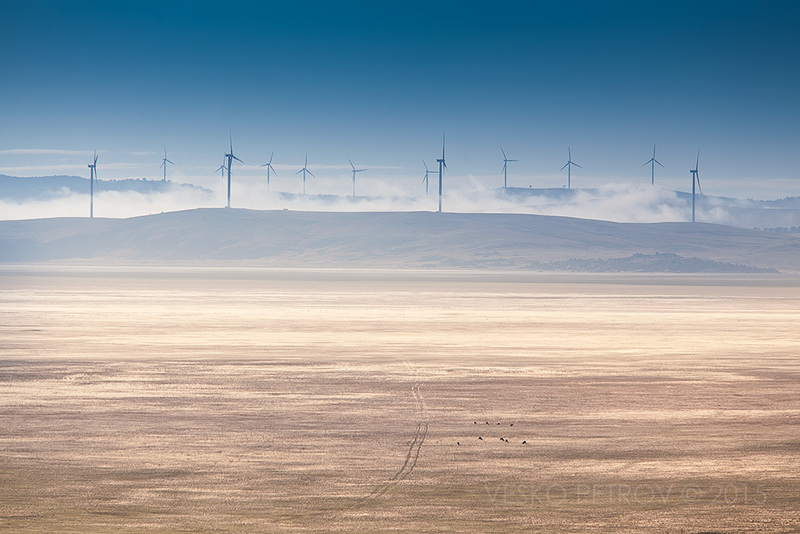 And of course the obligatory shot from Weereewa Lookout of the wind turbines across the lake. Trouble is Mike doesn’t know where the meeting place is, though he’ll never admit it. Despite his great orientation skills, we drive like headless flies around a camping ground and the casual campers there are looking at our intrusion with great annoyance; we drive up to the parking area of Cotter Dam, then back down to the camping ground to annoy the casual campers there some more. 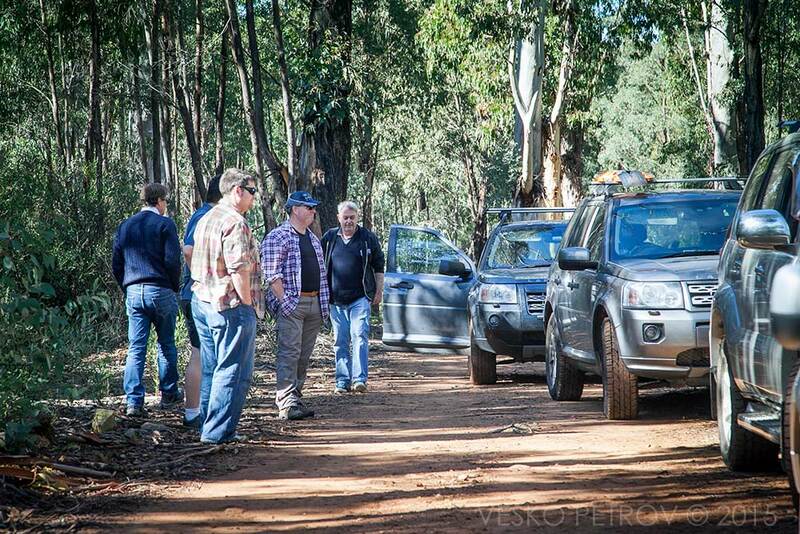 Finally Mike will find some information or lost memory to lead us to the right carpark, where four guys are standing around two cars – Nick with his late model Freelander 2; Tony with a Toyota Prado and his two great sons Ben and Nick. It looks like they’ve been waiting here for a while. At this moment I have the impulse to apologise profusely for our late arrival, but instead I busy myself with setting up a group photo, leaving Mike, the more articulate between us, to communicate with the four blokes. While I’m fretting about the lack of composition in my photo (the cars are too wide apart, but I am too shy to ask their drivers to park them closer together), I carefully listen to the tone of conversation between Mike and Tony, expecting to detect some kind of a clash. 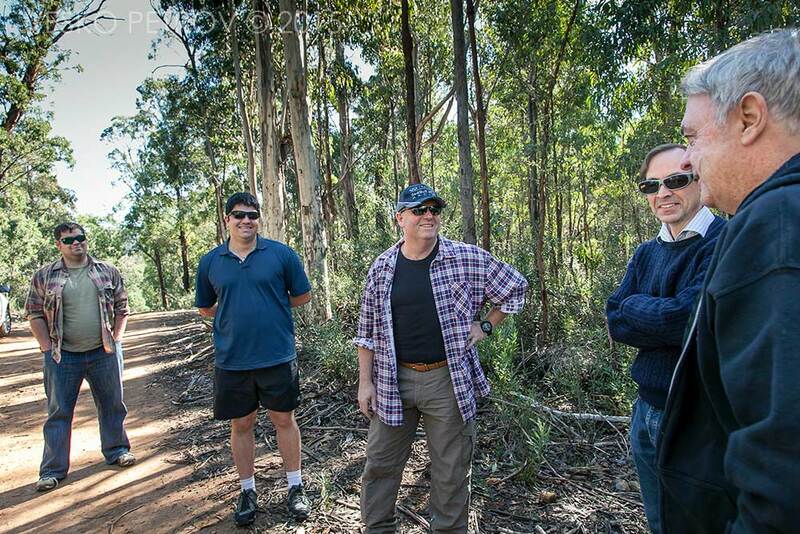 I can immediately see that Tony is a natural leader and he knows this country well, while Mike is the initiator of the whole Brindabella trip and doesn’t lack experience either. This clash between the two four-wheel drive gurus is of course a product of my imagination; we settle comfortably in our driving positions in the little convoy heading to Mt. 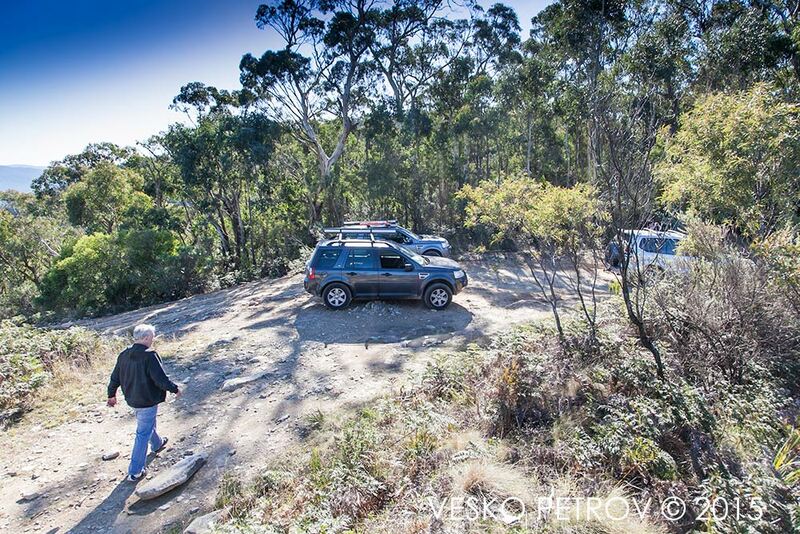 Coree: Tony as a passenger in Nick’s new Freelander 2 at the front; Tony’s boys driving behind them in the mighty Prado, Vesko takes the uninspiring third position, while Mike keeps our back safe and makes sure noting’s left behind. I diligently follow Mike, but he doesn’t know where the meeting place with Nick and Tony is. The weather is perfect. 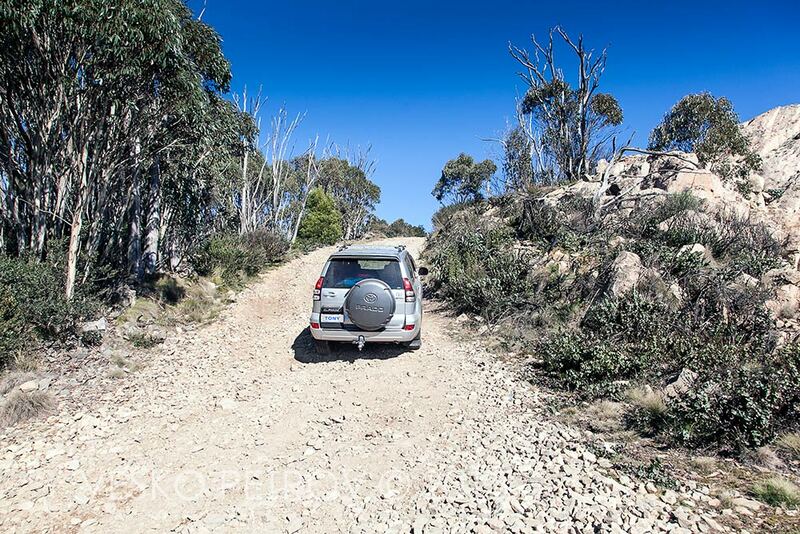 First glimpse of the Brindabella Ranges. At this moment I feel very happy. We are finally here. 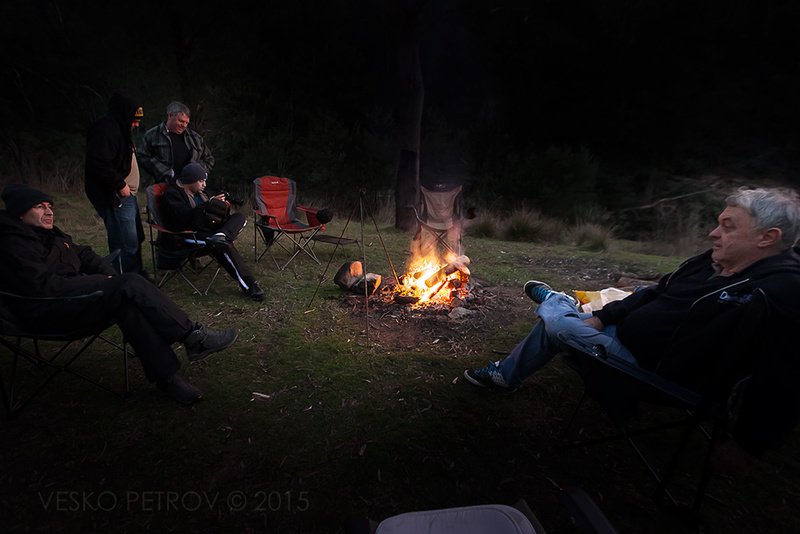 Nick and Tony discuss the plan for our Brindabella Adventure. I can’t believe our luck with the weather – 18° C, but bright and sunny, without a cloud in the skies and most importantly not the slightest breath of wind. Tony tests the UHF radio and I feel really good to confirm that my channel 15 is working well. From the front Tony warns us of the numerous cyclists, pumping their pedals at every dangerous bend. There must be some kind of a cycling competition going on. We give them wide berth. 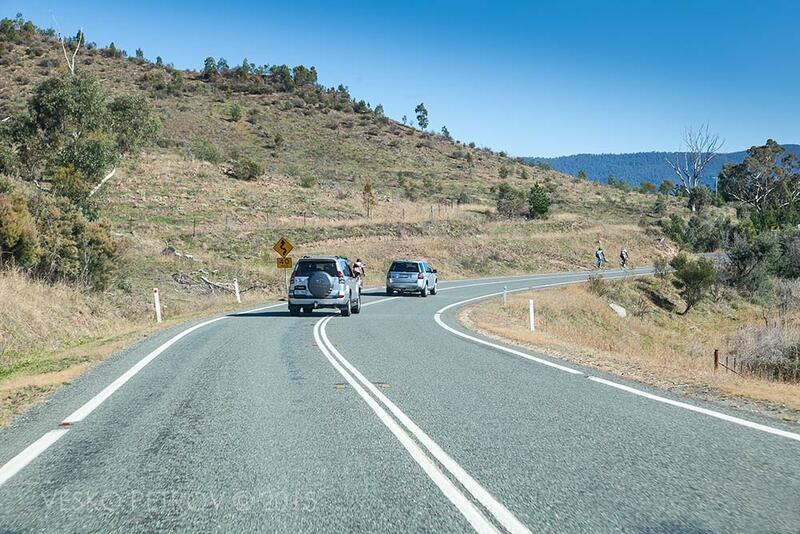 Soon the cyclists disappear and Brindabella Road becomes a gravel road. 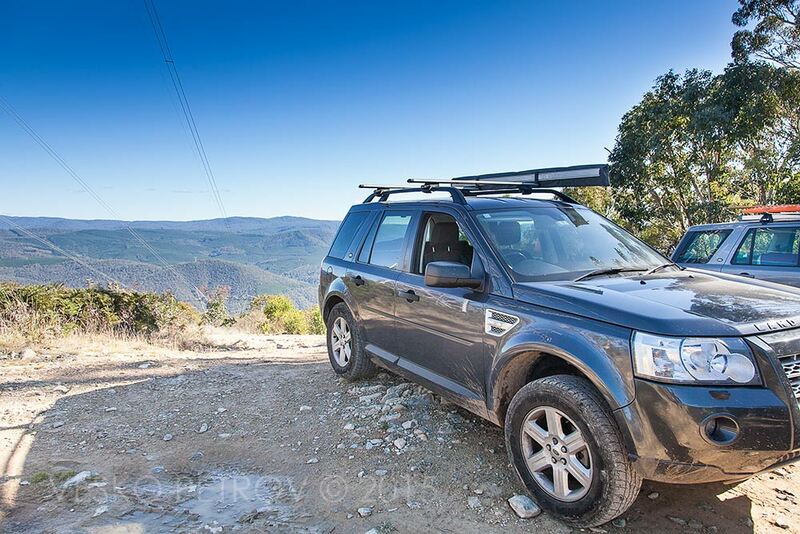 Nick’s Freelander 2 turns into Curries Road and following him we stop to deflate the tyres down to 26 psi. I have the feeling that our real trip starts here. Curries Road is pretty good but still we drive very carefully. 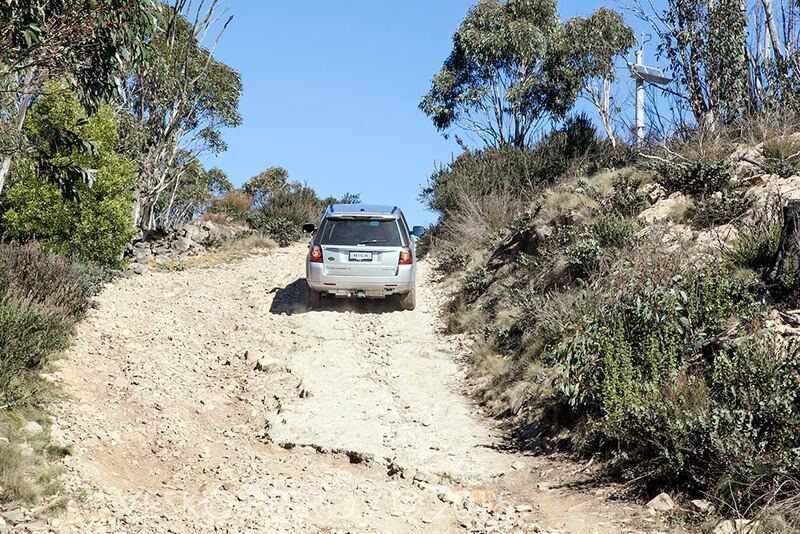 It takes us to Pabral Road, which is a bit more challenging but still nothing that would make me concerned. I realise the knowledge that I am in the company of very capable guys makes me relaxed. The drive through the forest is pleasant and unhurried. 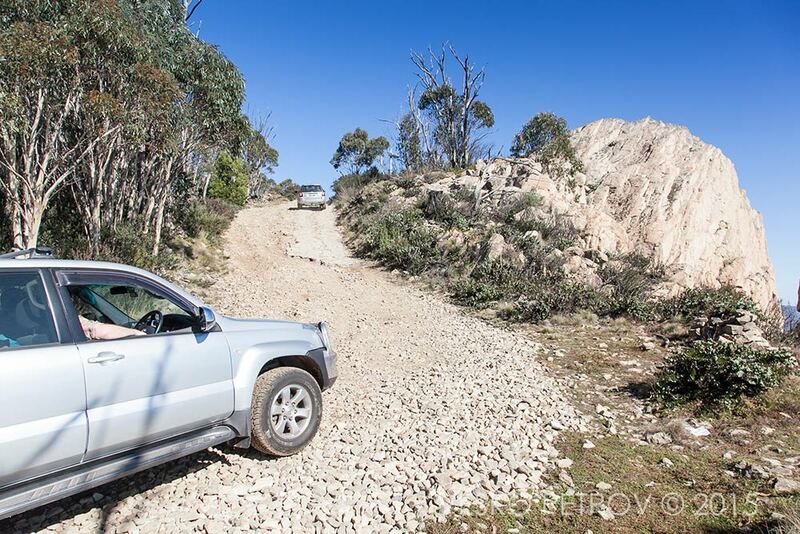 It doesn’t take long to reach the climb for Mt Coree. Before the final ascent we take a short break. I find that I enjoy this slow going attitude. Without the guys, I would push myself and my Landie much harder and possibly wouldn’t enjoy it as much. Cyclists on the road. We give them wide berth. 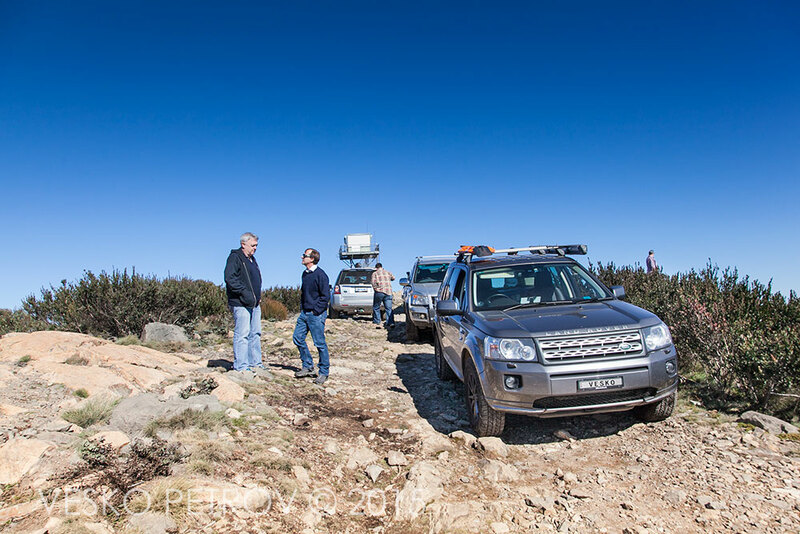 Driving in a convoy – I realize it is not that bad. 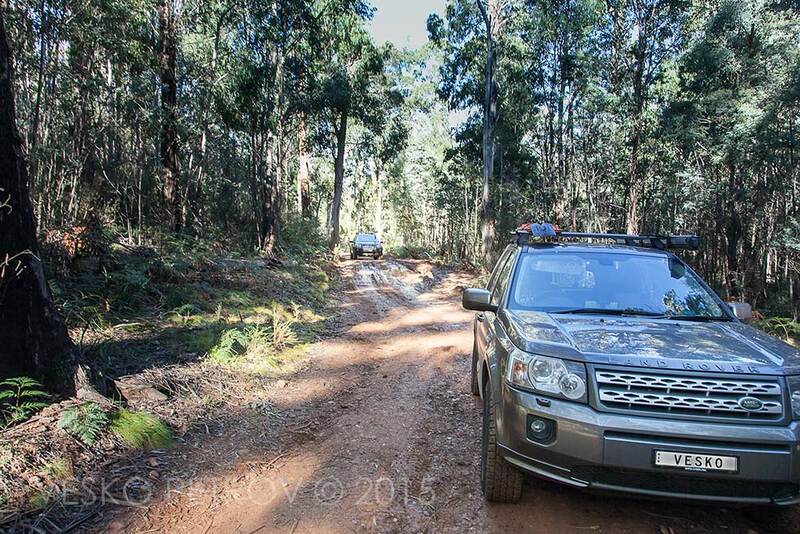 Into the forest and finally on a dirt road. I’m surprised how good the condition of the road is. This must be Curries Road. Tyres down to 26 psi (for me at least). Our real four-wheel driving strarts here. A rare muddy section on the track. We had great luck with the dry weather. We stop often for breaks and everyone is very relaxed. The guys are still testing the boundaries of interaction in our team. By now everyone has learned that we will be comfortable in each others company. Well, that’s how the track looks like. I expected something tougher and now I’m relieved. 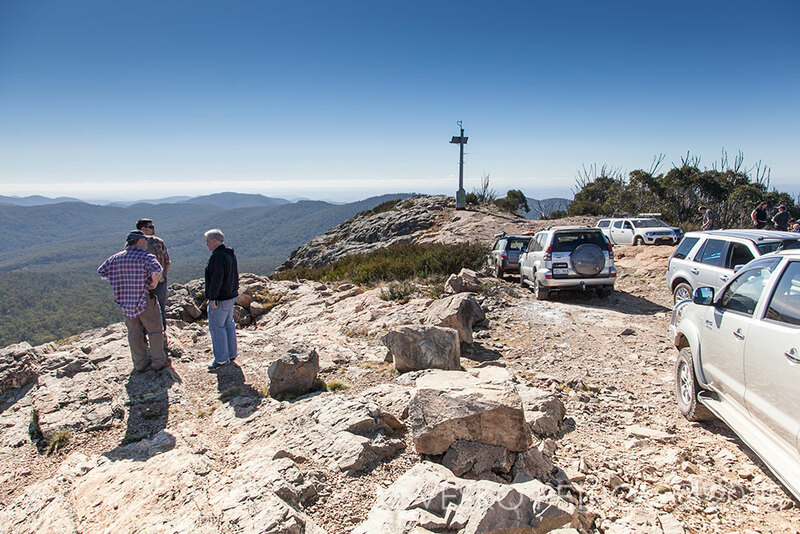 Last stop before the final ascent of Mt Coree. 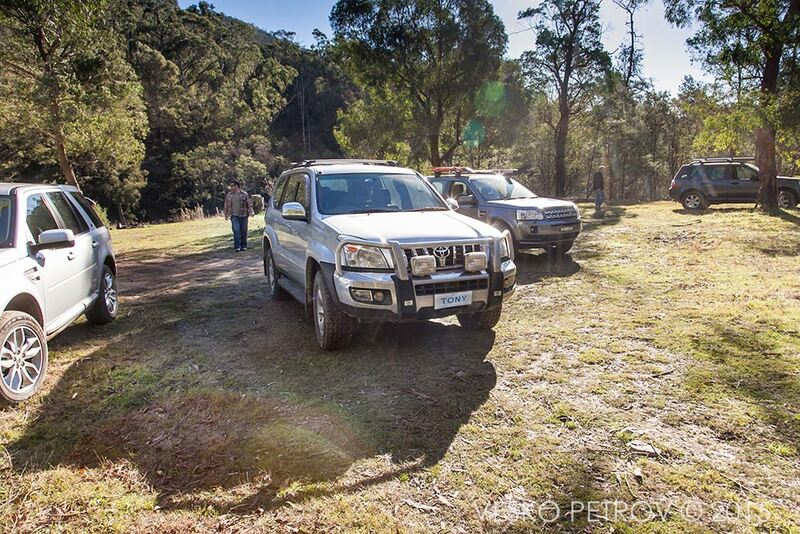 The mighty Prado waiting for Nick to climb. 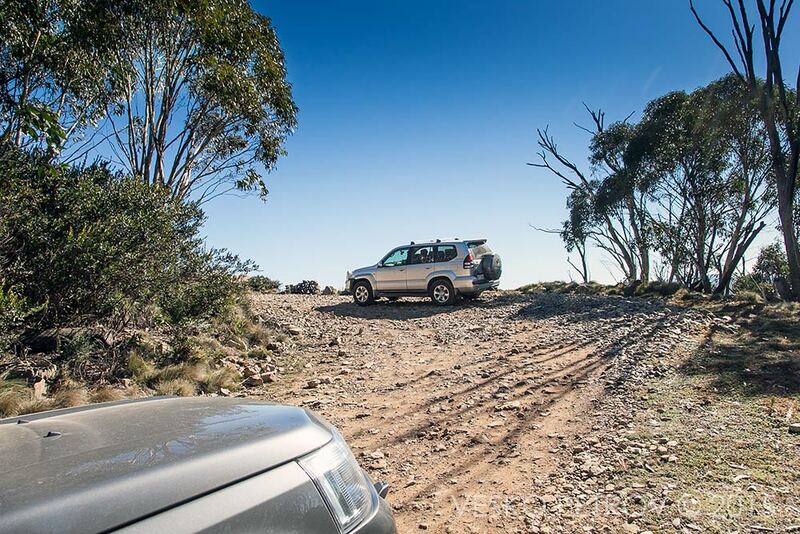 Tony’s boys, Nick and Ben climbing Mt Coree in Tony’s mighty Prado. The final stretch to the top is steep, but it has a concrete section in the middle and we climb one by one quite easily. Up there suddenly the whole world opens around us. 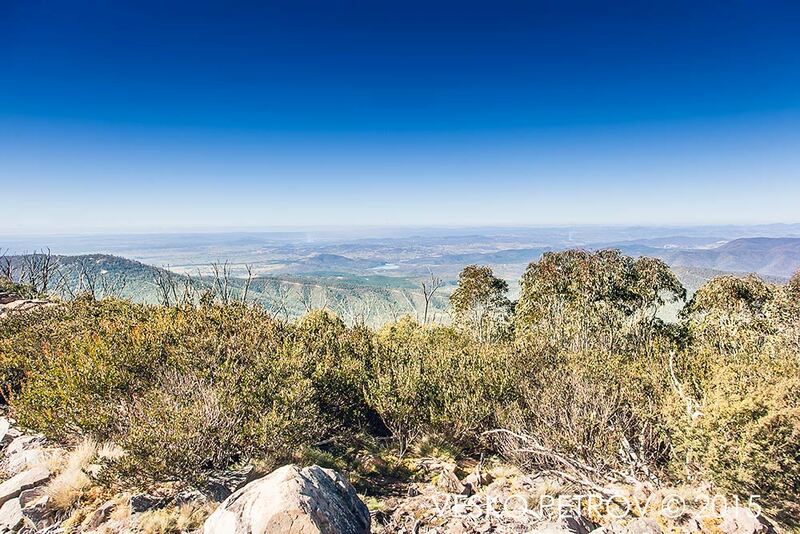 It’s breathtaking – huge skies and 360° panoramic views over dreamy mountains. The clean cold air fills your hearth with freshness rarely experienced. O, the ambient tranquillity, the clear-headedness of this place! Up here we become good human beings, separated from our important/stupid, big/small ambitions. I have the strange feeling that everyone is fused with the still air, content with themselves, happy to be here right now, right at this moment. On top of Mt. Coree I get to know Nick, the guy with the new Freelander 2. Nick is a scientist based in Canberra. He must be one the gentlest of men I ever met, softly spoken and attentive. In our short conversation I sense deep intelligence. He asks me if I am a professional photographer. I’m semi-professional I semi-lie to him, because I want him to like me. I talk to Tony as well, the Prado man. 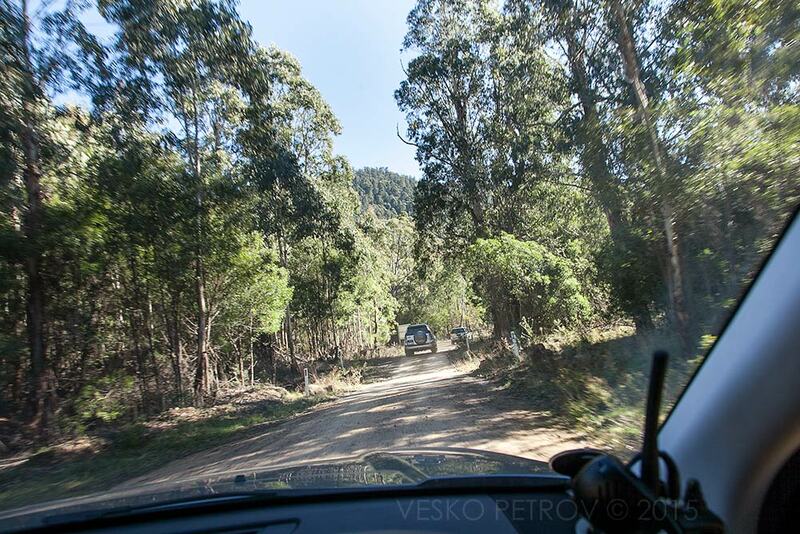 By nature Vesko is full of prejudices, one of which is a suspicion towards Toyota drivers. However, there is nothing suspicious about Tony. On the contrary, I discover that Tony is a warm, openhearted dude. He is very patient explaining to me the new plan they have devised with Mike for our movement to McIntyre’s Hut for our camping night. Tony suggests we tackle the Powerline Trail, instead of the longer rote through Flea Creek. The weather is good and the track should be in good condition. This is great, I think – might be more adventurous. 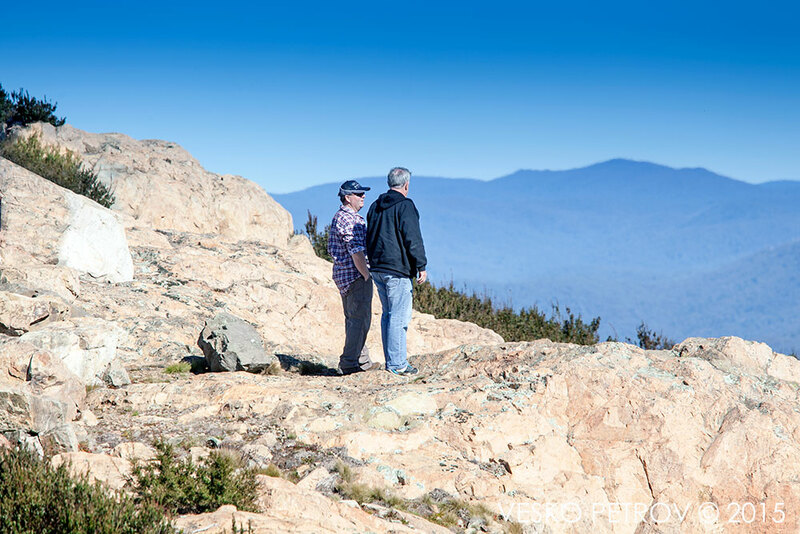 Nick and Mike on top of Mt Coree. 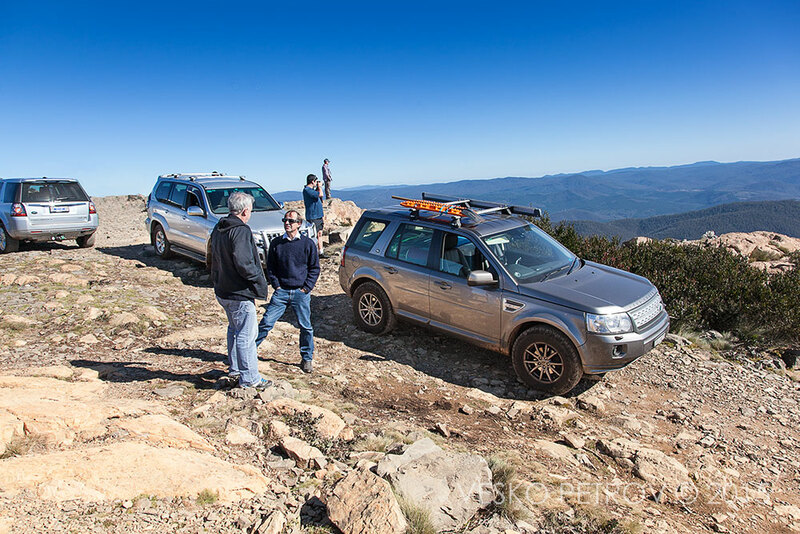 On top of Mt Coree there is not enough space to fit Mike’s Freelander 2 in the same shot. 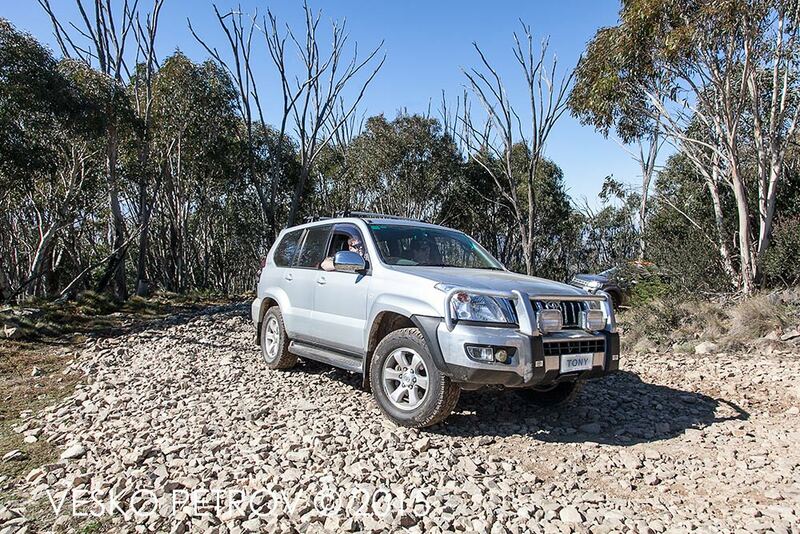 But here it is, Mike’s Freeelander 2 on top of Mt Coree. 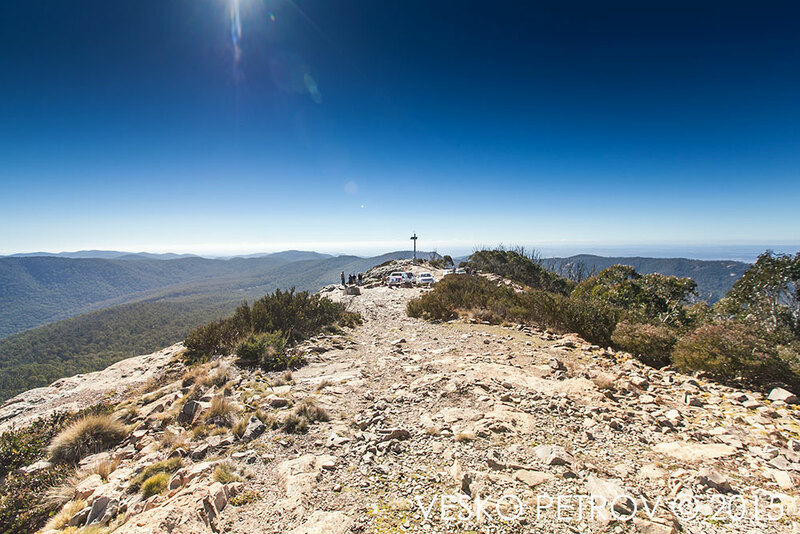 Mt Coree, the long shot from the top. 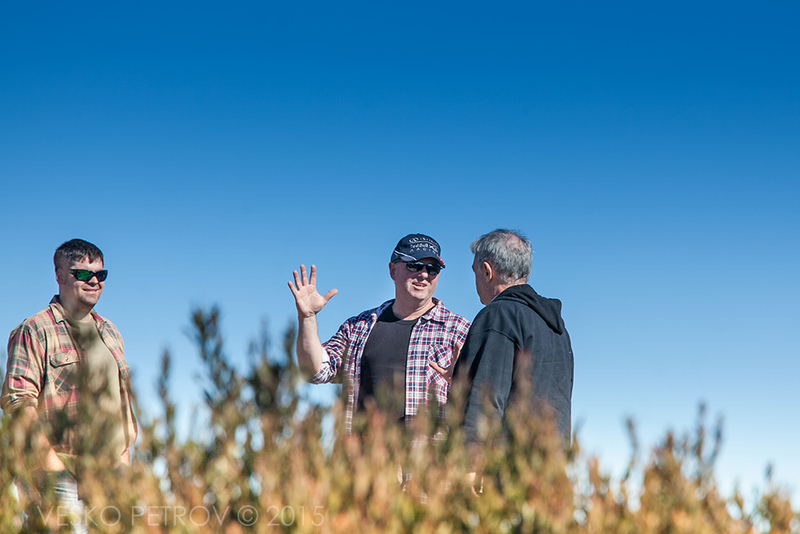 Mike and Tony are discussing the plan for our next move. 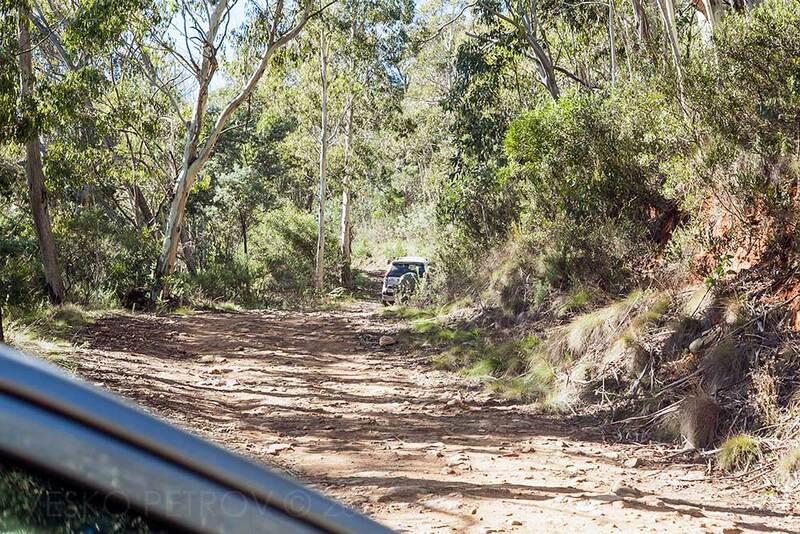 Perhaps we should drive the Powerline Trail, instead of Gentle Annie Trail, says Tony. Mike considers for a moment and shakes his head in agreement that the Powerline Trail is a good idea. 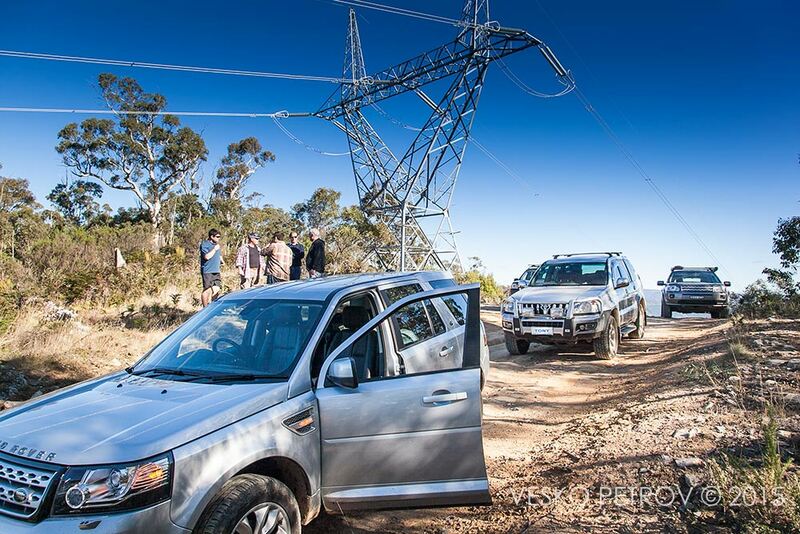 Our two four-wheel driving gurus are quite happy that they have finalized the plan to drive Powerline Trail. 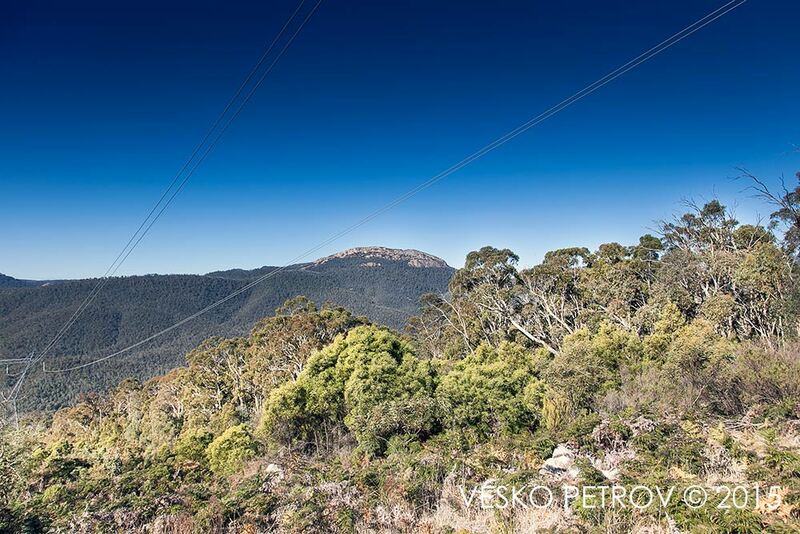 Vesko is also happy to be on top of Mt Coree. We are ready to continue, but have a momentary stop to reflect the beauty of this place just a little longer. Yes, it is breathtaking, I know. 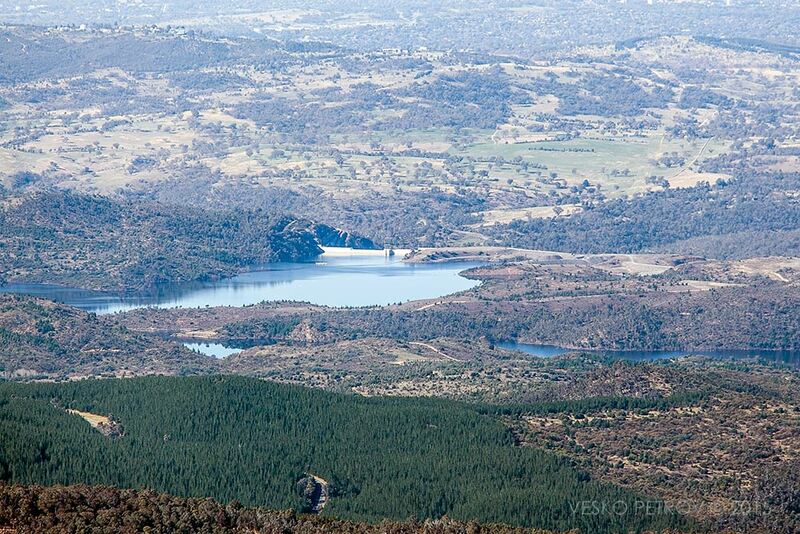 Somewhere there should be Cotter Dam. Along the Powerline Trail I understand something about my recklessness. I’m eager to move quicker, but the steady slow progress of the Prado in front of me, driven by Tony’s sons makes me stop and reflect. They are very cautious and careful at any hill, turn or depression on the trail. They drive safely. If it was not for them I would’ve rushed up with double the speed and triple the risk. At this moment I feel grateful to the boys for teaching me a lesson. The Powerline Trail is very nice; it twists here and there around massive metal pylons holding thick wires with high voltage. At the top of the ridge we stop briefly to look at Mt. Coree across the distance. Everyone in our party is much more relaxed now as we nearly know what to expect from each other and everyone’s expectations seem good. 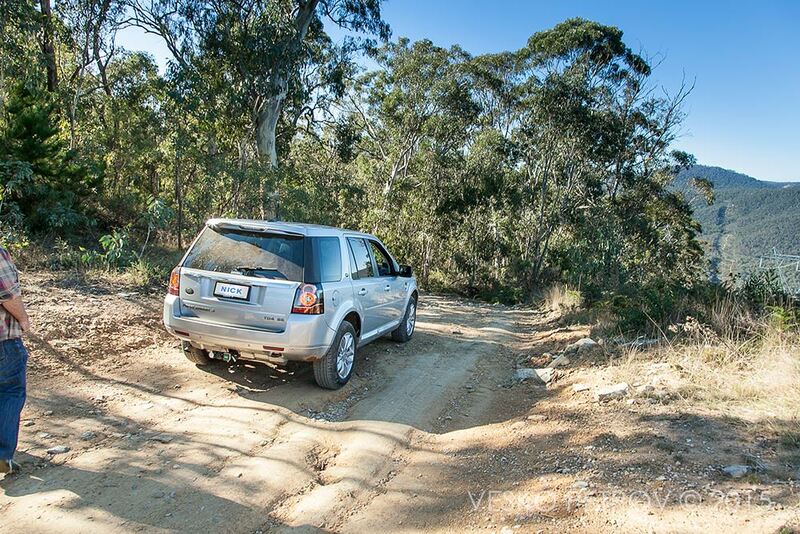 I try to joke with Nick, asking him if he is sure he applied the handbrake firmly enough (his new Freelander 2 is leaning dangerously forwards down the gorge). Nick smiles, but nervously looks at his pride vehicle. I should not joke as my own not so new pride vehicle is leaning dangerously backwards in the other direction. Seeing me making photos, Mike has the best joke involving bodily functions. Sadly I’m too slow to catch it properly. Hey Mike ;-). 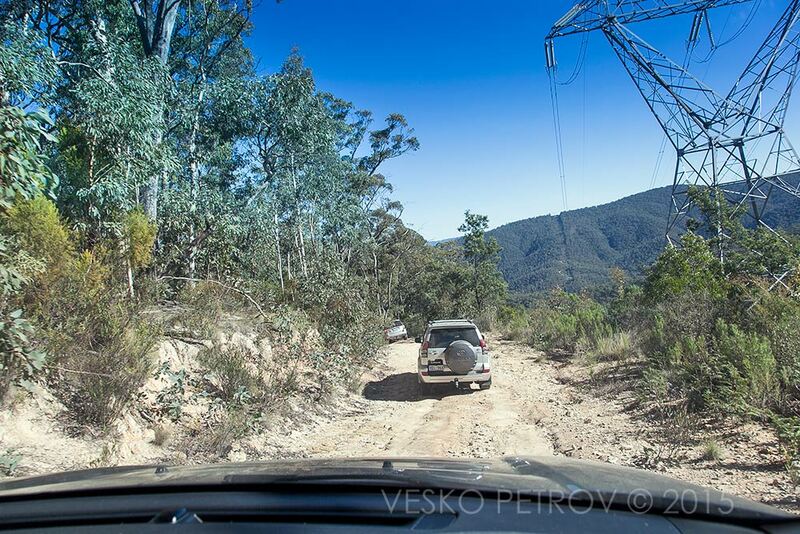 Driving on the Powerline Trail. Here I try to get all four vehicles in one shot. You can see Mike in the rear vision mirror, which is still cracked (didn’t have time to re-place it). On top of the ridge we stop for a break. Everyone envies Nick for his new Freelander 2, as well as for his warm high-tech jacket. 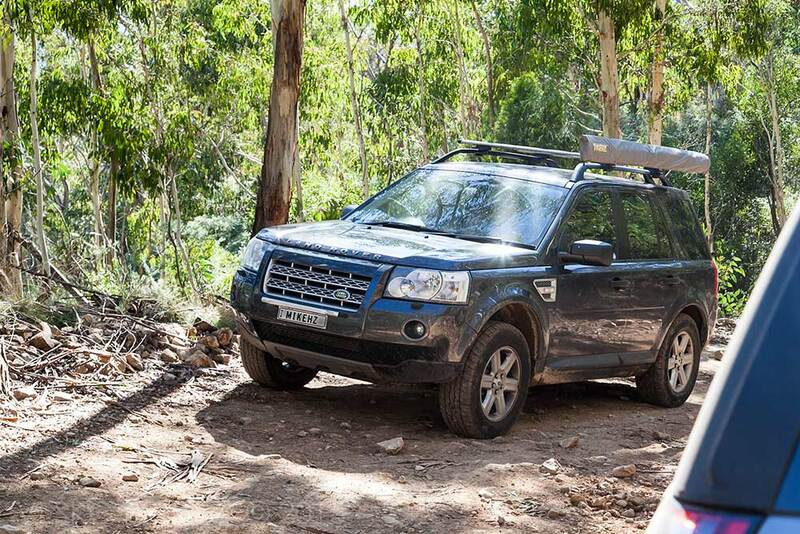 Mike’s Freelander 2 on the Powerline Trail. 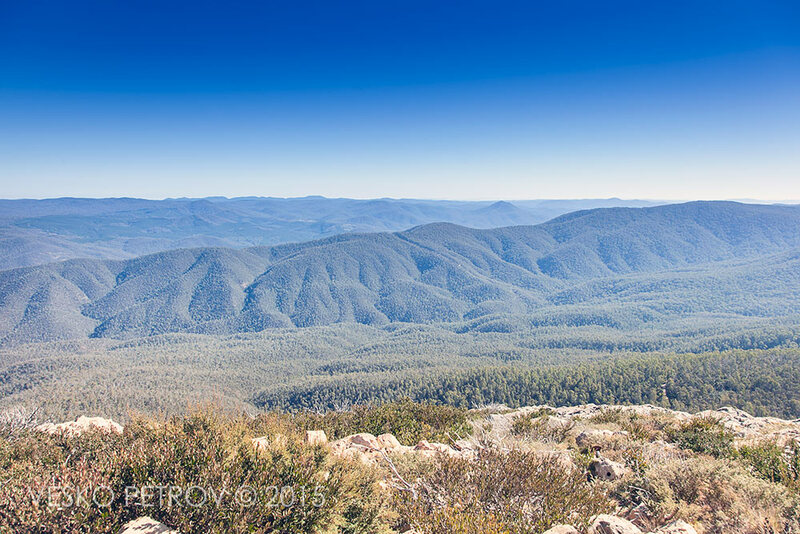 Mt Coree in the distance. Cant believe we were there just moments ago. 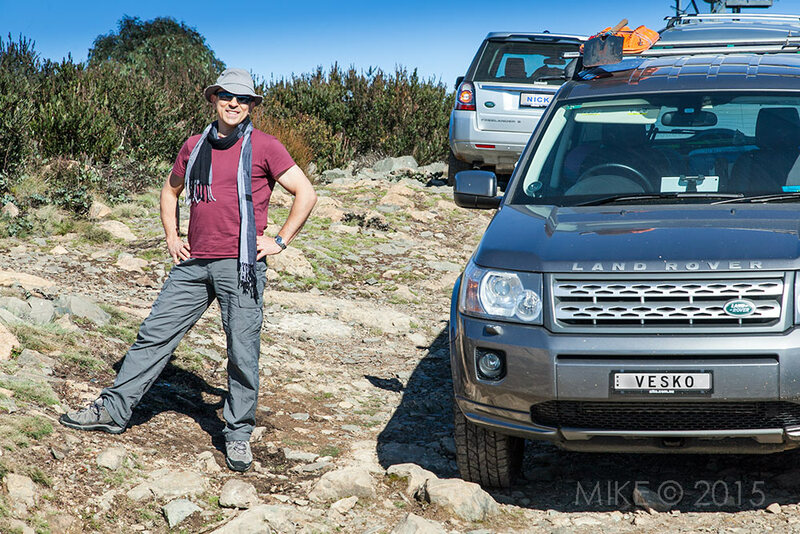 Mike’s and Vesko’s Freelanders 2 are dangerously leaning backwards. Luckily we have applied the handbrakes properly. 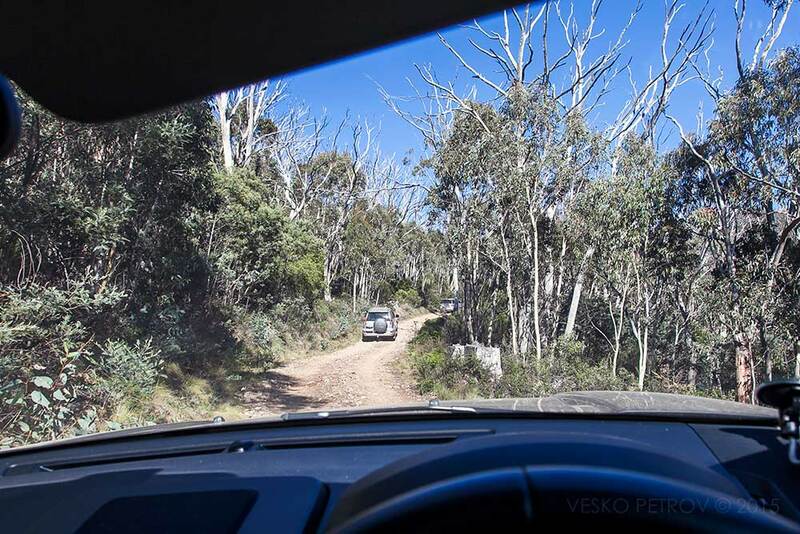 Next is the steep drive down to McIntyre’s Hut camping area. 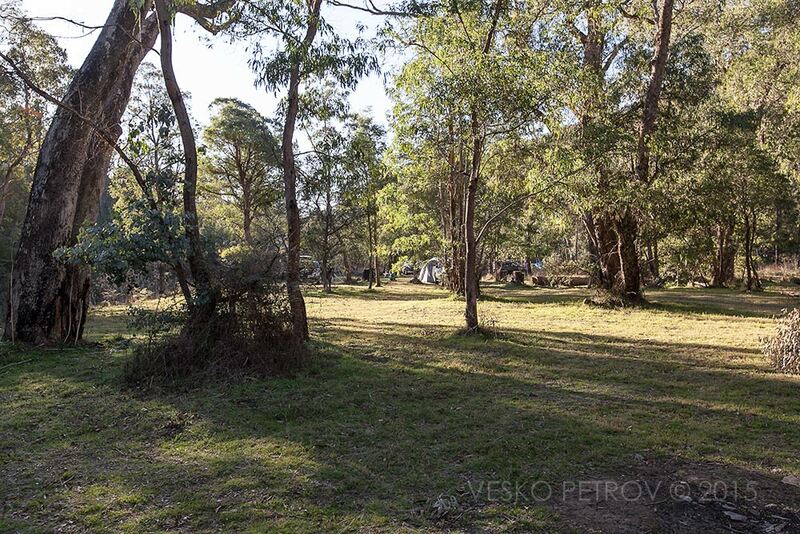 This is a huge place where the few other campers simply disappear amongst the trees. There is a river called Goodradigbee River, full of water after the recent rains. 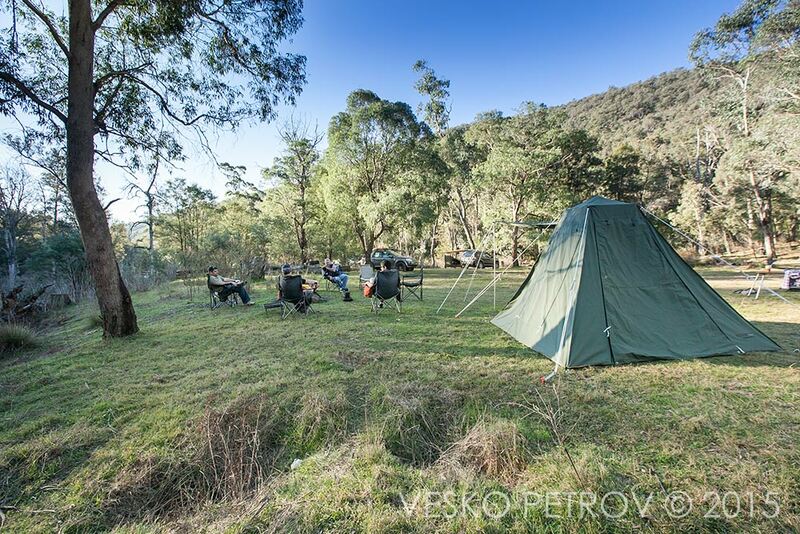 Tony finds us a large secluded grassy area, where we can set up our camp, preserving each other’s privacy. The way we set up says volumes. Mike with his car awning and a quick fold out tent cot is ready for party in about five seconds. 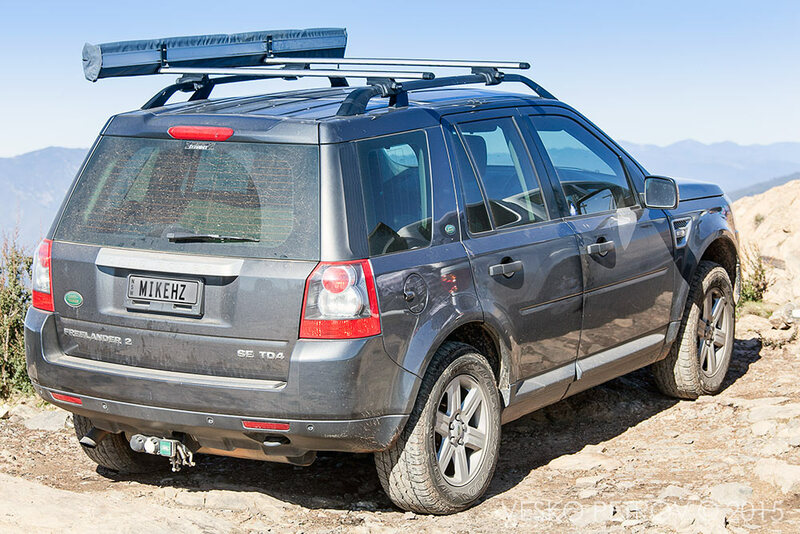 I am a bit slower with similar car owning and a couple of boxes, plus the esky, which I have to pull out of the car to open space for my sleeping mattress there. Tony and his sons stretch a huge comfortable tent, while Nick is lifting up a proper touring tent. 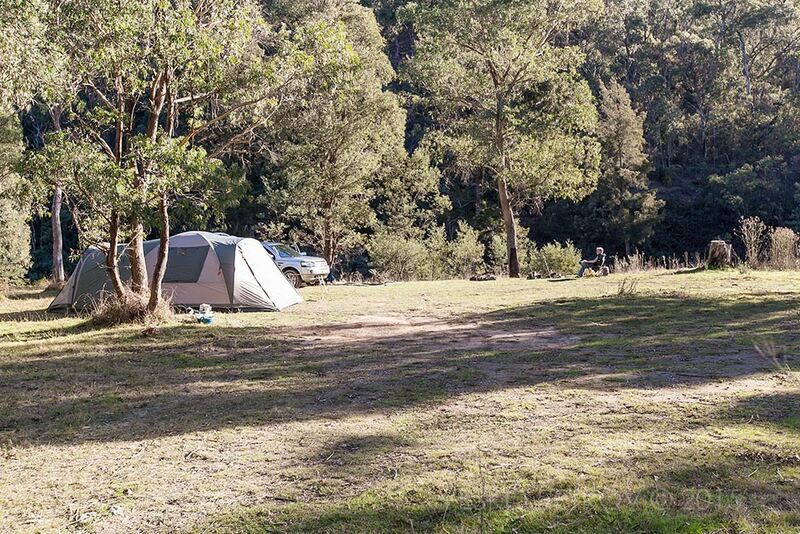 Tony has found the best camping place, that will fit all of us, each preserving their own privacy. Mike is long time done with his camp and is enjoying the last rays of the sun. 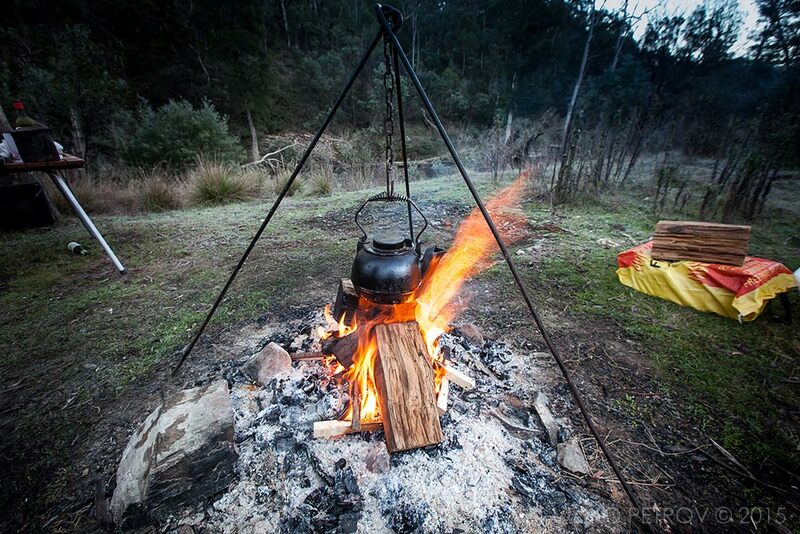 This is a remarkable teapot. It belongs to Tony, who’s been in it’s possession for the last 30 or so years. Tony with the remarkable teapot. 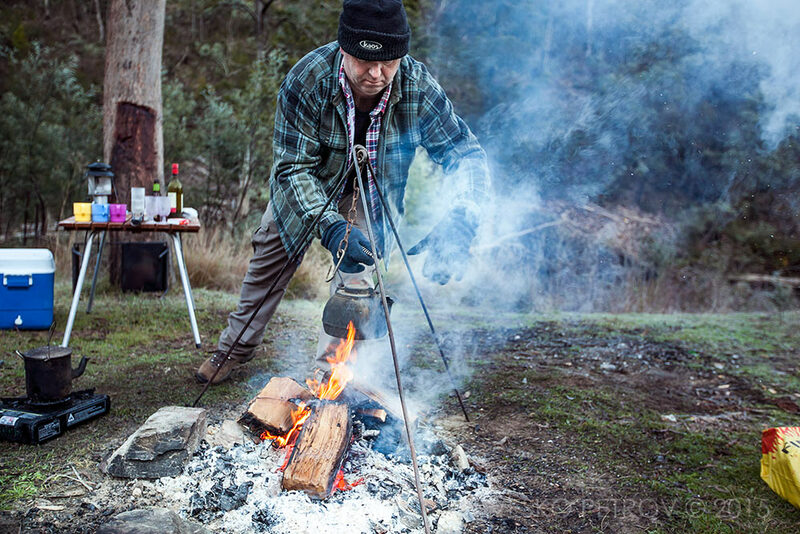 Tony is a master chef on camp fire (he taught me how to cure a metal plate for the perfect BBQ). Great guy. Left with nothing else to do me and Mike light the fire with a considerable degree of professionalism. While the guys are building up their tents and Mike is tending the fire, I stretch my legs to take a look around the river. The surrounding ridges have killed the golden light and it is no longer good for photography, but some commotion up the river attracts my attention. I hear a clear girl’s voice shouting commands in a familiar language. I get closer to find a slim blond girl agitatedly calling at six other slim girls in the water to do something. I catch the word “бьйстрее“, which in Russian mean quicker and see how the six girls are trying to form a figure in the water. This is the beautiful Irina Solovyova, training her Russian synchronized swimming team for an upcoming competition. My knowledge of Russian helps me win her trust and I learn that Irina has taken her team out of Russia and to Australia as a form of protest against the oppression of the Russian dictator Vladimir Putin. It is freezing cold and the six girls are visibly shivering in the icy water. To build their strong character, says Irina but I am not convinced that this coaching technique would work. She asks me not to make photos, as their fierce rivals the Americans may steal their new moves. I comply and leave the beautiful Irina to her work. Our camp from a distance. Goodradigbee River. This image was supplied by Tony. It is much nicer than the one I had from this position. Thanks Tony. 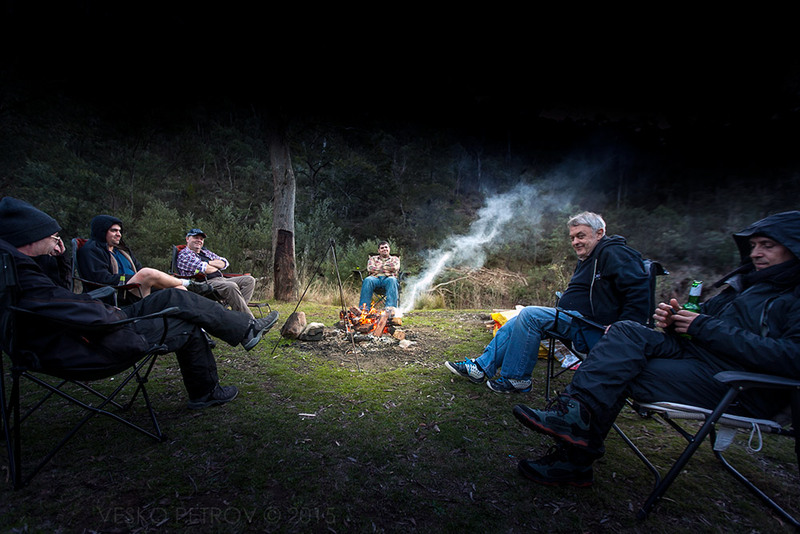 Back at the camp, the guys are ready for an epic BBQ. The fire is in full swing and this is a good thing as the night grows very cold. Everyone puts on every single clothing item they have (at least Vesko does). It’s getting bloody cold. Not for Nick though – he cocoons himself into a high-tech electrical jacket. We are very curious and Nick demonstrates the battery, which switched on gives sufficient power to the heating elements embedded in the fabrics of the jacket. It even has an USB port! O-o, we envy him so much! The epic BBQ is run mostly by Tony and his boys. Nick and Mike appear to be minimalists – for dinner they have a sandwich each and drink only mineral water and tea. On the other hand me and Tony with his boys; we love our excessive servings of roast meats, sausages, steaks, mushrooms and onions in chilly sauce. Having prepared my pork chops and pork ribs for the grill, I forget to ask my companions if any of them are Muslims (I don’t want to be offensive with my dinner), but I discover that Tony loves Shiraz (same as me). 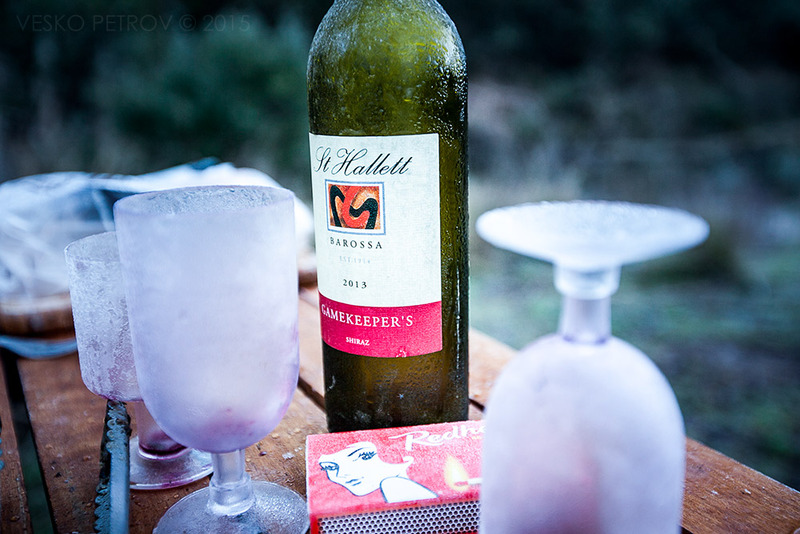 After a few glasses we totally agree that the Australian Shiraz is the best in the world. Our party around the fire. Our merry chat is interrupted by the Russian synchronized swimming team. Shivering in their high cut swimming costumes, they are attracted by our warm fire. It is obvious that they need help, as Irina has “forgotten” to bring their sleeping bags and tents as part of her character building approach. 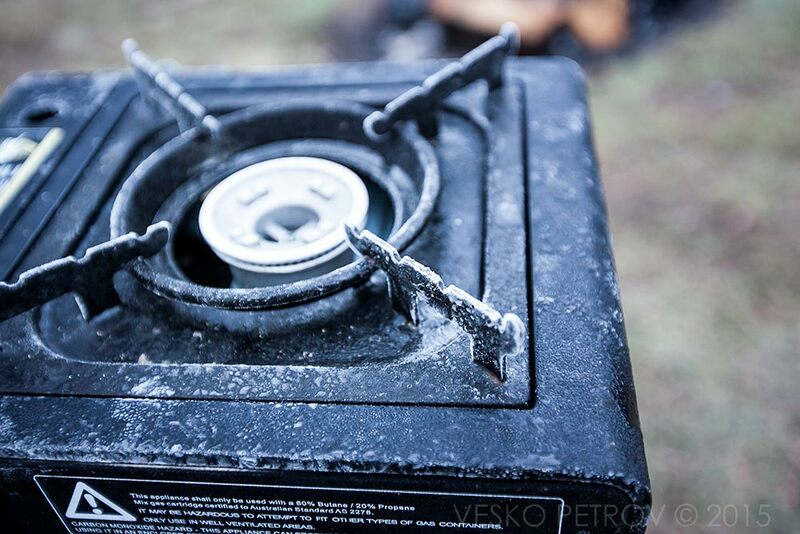 We are ready to help – each of us will take one of the slim Russians to warm up in our sleeping bags. Problem is we need a seventh guy for the beautiful Irina. We discuss the problem and quickly find a solution – Nick with his nice and warm high-tech electrical jacket can easily take care of two slim girls. Problem solved. Nick, the most polite person in our party does not protest and quietly resigns himself to the extra burden. 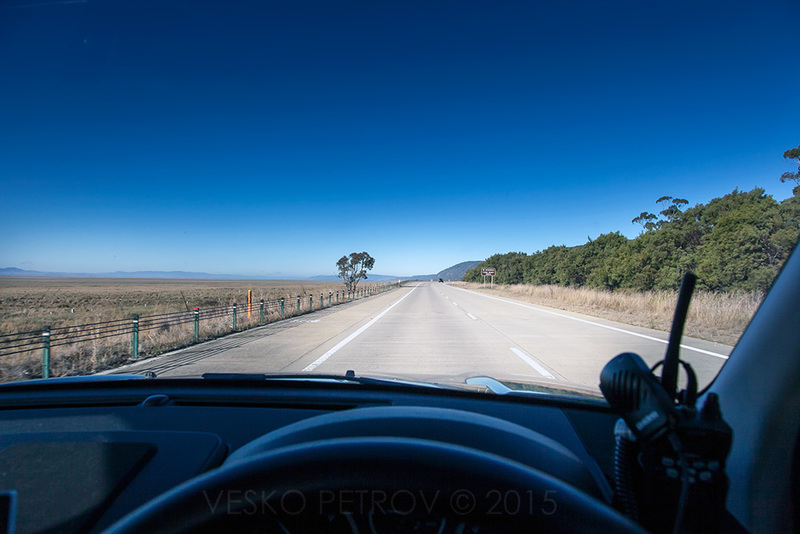 The road back to Sydney seems longer. I’ve been fans of both you and Mike for many years now, so it was great to see a trip with both of you involved. I have always enjoyed your commentary and photos, whilst Mike’s wisdom of the country has always been savoured. I just wanted to say that I would be privileged to host you (and your wife/kids etc – or companions???) 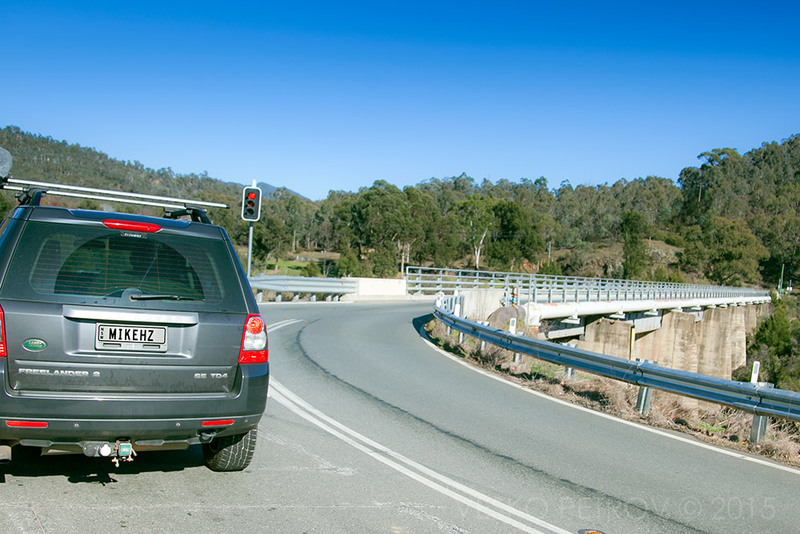 if you take the punt and come up to Queensland for a drive. With enough notice, I can also take some time off and show you some great spots, some well known and others quite a secret. 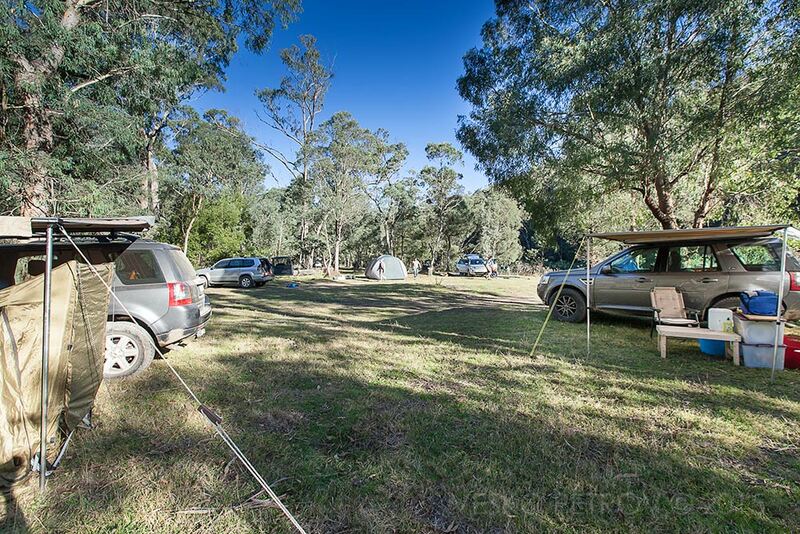 I own and operate a 10 acre accommodation business – camping, caravanning, motel, cabins etc in Maryborough. 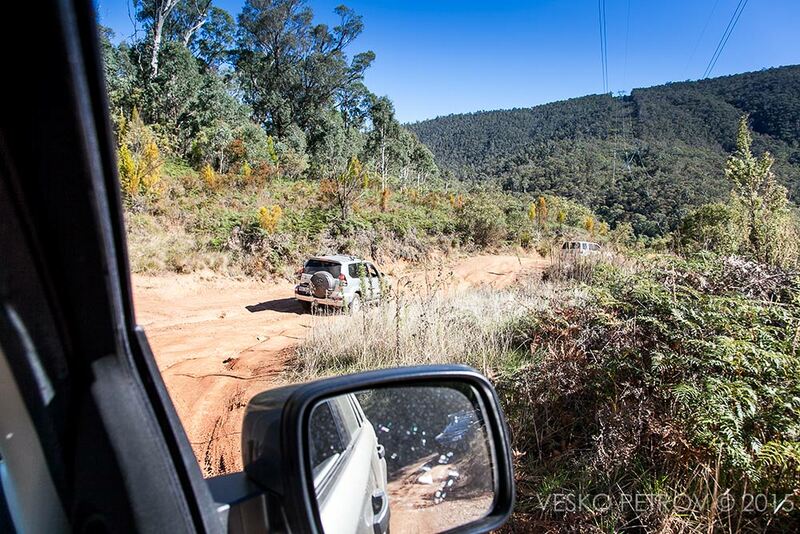 We are the old town of Queensland and have some wonderful offroading experiences very close by, including Fraser Island, the forestry of the Great Sandy Straights, the extinct volcanos of Biggenden, the Woocoo Waterholes and Claypits, the awesome beach NP of Kin Kora. Anyhow, if you are ever up this way, I’ll look after you. Hi John, you are very kind. I’ll make sure to give you a buzz next time I travel to Queensland. Thank you for mentioning of all these places. Now I put them on my wish list (I’ve been only to Fraser Island and loved it). Thank you.